During my lunch hour travels today I wandered down to the nearly-world-famous games store in Gastown. My father really likes those “impossible” puzzles that have a million and a half pieces, repeating patterns and no borders, and I figured that that would be a good place to pick another one up. The games store, for those who have never been, is an experience in itself. I’m always amazed at all the weird and wonderful ways people have devised to amuse themselves. The variety in there is overwhelming: puzzles, board games, model sets, tin soldiers, cards and outdoor games of various incarnations and vintages. Some are old favourites and others, like the one pictured right, well, aren’t. At any rate, while talking to the staff there, I learned that the games store will be closing some time in November. I asked if they would be moving to a different location, but no one was entirely sure. So if you’ve secretly been coveting that limited edition Canada-, Cat-, Dog- or Kiss-opoly, I’d suggest you go out and get it quick. As much as it pains me to rain on your parade, Drexoll games is a much better shop for most game needs. The last time I was near that Gastown shop, it was called “The Games People,” and was already pretty sad and strange. But in a good way. To back up Ryan’s observation, one of the people working at Drexoll, by his own admission, is a Games People family member who couldn’t take it anymore and turned to the Drexoll dark side. The ability to play the demo games is in itself argument enough for making the trip to Drexoll. On the other hand, I have to admit bemusement at all the used vintage games at The Games People store. If I ever see a copy of the Micronauts Board Game there, or the Scooby Doo board game, for not too much, I’m snatching it up. Or Mystery Mansion. Or Oh What a Mountain. 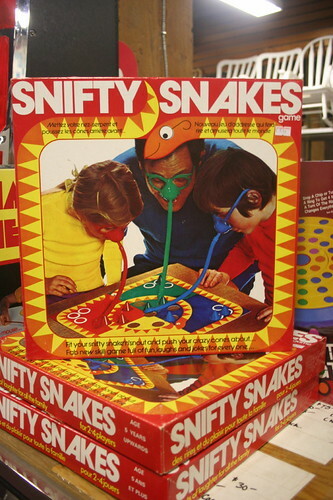 Even though gameplay quality of recent games blows all those out of the water (well, except for Mystery Mansion, which was a pretty captivating game as well as just having interesting pieces), they still don’t make board games that mechanically interesting anymore. They say Puerto Rico is a fantastic game, but I think any game can benefit from a mountain goat, dubbed “The Battering Ram”, who runs your pieces off the board.